This is the adventurous story of Gustav Eisen (1847-1940) who begins a brilliant career in Sweden as a natural scientist, writing a dissertation on the natural history of Gotska sandön, a small Swedish island in the Baltic in his early twenties, and then proceeds to a legendary earthworm expert. The 1870s saw young Eisen travelling to California for fieldwork and becoming a leading figure in the San Francisco Academy of Sciences. However, he turned his hand to winegrowing and wrote a pioneering work on the production of raisins, but even now, being the “Raisin King”, he went on to travelling widely in Central America as a collector of all manner of things. His rich collection of Maya textiles from Guatemala remains unparalleled to this day. He also campaigned successfully for the foundation of Sequoia National Park, where he later, at the foot of Mount Eisen, would be buried. The first-person narrator depicts Eisen´s adventurous journey through life by investigating recorded material like letters and following him to places in today’s California and Sweden. 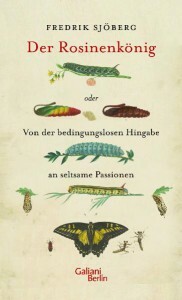 He shares a lot of details worth knowing and lets himself be intrigued by Eisens interesting life as well as he rerecognizes himself in him as an insect researcher, world traveller and art lover. Eisen as well as the narrator allow themselves to digress from the original plan and decide to follow their lively passion for whatever tickles their urge for new knowledge. The shifting between Eisen´s 19th century California and Sweden and the narrators modern world and the oscillation between academic ambition and the private fascination and joy of scientific and beautiful objects while observing the role of erratic fate, makes Sjöbergs autobiographical novel so very appealing and credible. Fredrik Sjöberg was born in Västervik in 1958. He works as critic, author, translator and a columnist for Svenska Dagbladet and lives with his family on an island outside Stockholm. He published The Art of Running Away, How The Burnt-Out Executioner Found The Luck and What shall will do the nature.